OUCET Third Phase Seat Allotment Results 2018: Osmania University (OU) are announced OUCET Final Seat allotment results on 5th September. All the candidates waiting for the OUCET seat allotment Order list can check from the official website, oucet.ouadmissions.com. candidates who have come across the OUCET certification verification process from 9th July to 17th July can now check the OUCET Seat Allotment result from today. Candidates allotted admission in this seat allotment will have to report at the allotted colleges. Students seeking admission into various postgraduate courses and who had already applied to get admission can check the details from the following article. Osmania University is one of the best universities of Telangana state. It offers various UG and PG programmes for the students. Osmania University offers various educational programs for aspirants. It also monitors the education system and maintains the quality education for its understudies. The OU has recently organized the Common Entrance Test from 4th June to 13th June for aspirants seeking admission into various PG Courses, PG Diploma and 5-Year Integrated Programmes offered by Osmania, Mahatma Gandhi, Telangana, Palamuru and Potti Sreeramulu Telugu Universities. Candidates clearing the OUCET with good merit will get admission in desired courses. The OUCET qualifying candidates can apply for admissions in their interested colleges. OU has already done with the result declaration process, releasing of seat allotment (provisional), and document verifications processes. Candidates who are keen to check the OUCET Seat Allotment Result 2018 can download it from 21st July from the official porta, oucet.ouadmissions.com. The Osmania University has released the admission notification on 6th July. Candidates qualified for the OUCET examination have qualified the OUCET examination with good merit have started the online registrations for web options from 7th July. The university has released the provisional allotment list on 8th July and started document verification process from 9th July to 17th July for all qualified aspirants and web options exercised up to 19th july. After the document verification process, the Osmania University has come up with the OUCET seat allotment result on 31st August. Candidates can check the seat allotment result and download seat allotment order to report at the allotted college. 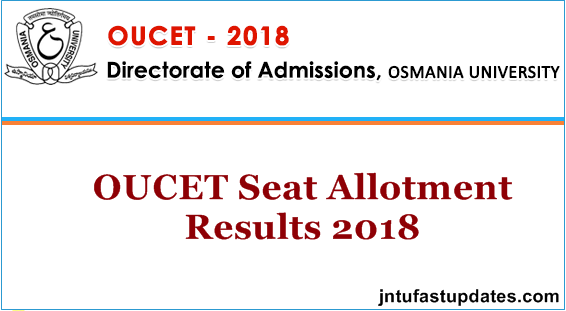 On the homepage, click on OUCET third Allotment Results 2018. Fill the empty fields with register number, password etc. The OUCET allotment result will appear on the screen. Download/ Take a printout of the OUCET Allotment order to report at the allotted college.